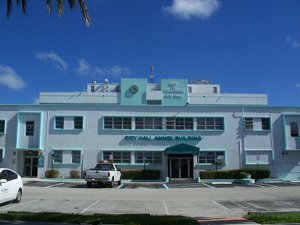 The City of Hollywood is a beachfront community located in southeastern Broward County about midway between Miami and Fort Lauderdale. Founded by Joseph Young in 1925, Hollywood is approximately 30 square miles in size and is Brorward's third-largest municipality with a population of roughly 143,000 residents. Hollywood has an average annual high temperature of 83 degrees and low temperature of 68 degrees. Hollywood has seven miles of pristine beaches, and the one-of-a-kind Hollywood Beach Broadwalk, a promenade that stretches nearly 2.5 miles along the Atlantic Ocean. Named one of America's Best Beach Boardwalks by Travel + Leisure Magazine, this brick-paved thoroughfare hosts pedestrians, joggers, bicyclists, roller bladders, and millions of others every year. Dozens of eateries and inns line the Broadwalk and the promenade also features the Hollywood Beach Theater, a children's water playground at Charnow Park, and many other attractions. Hollywood Beach also offers dozens of luxury hotels and condominiums such as the Westin Diplomat, Trump Hollywood and Margaritaville Hollywood Beach Resort. Palm Lane Villa No 5 Bldg. Hollywood Hills Park 52-2 Bldg. Hyde Hotel And Residence Bldg.